These look good? Need a seasoned builder to give me a thumbs up, it's been about 10yrs since I rebuilt a rear. 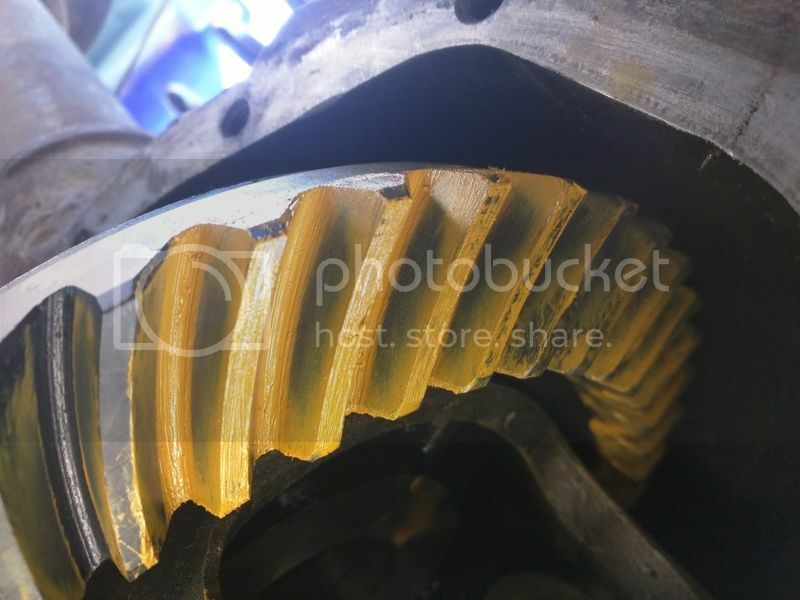 Backlash is at .007, .040 shims on pinion, 3.73 fat gear in a 3 series. Thanks. Last edited by superhondaz50; 12-31-2017 at 02:16 PM. Never built a rear end, but I understand it to require some major skills. Which rear end? It looks a little too deep. 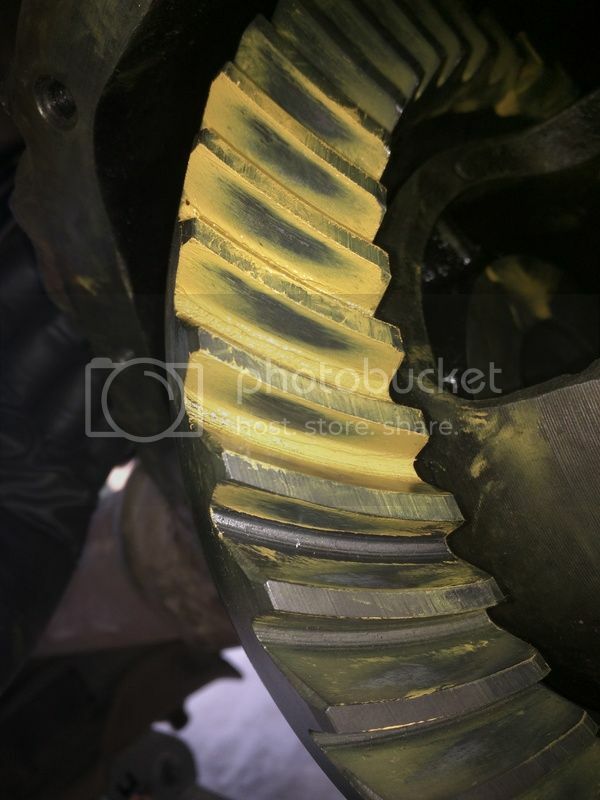 Try moving the ring gear away from the pinion a little & retest. For whatever it is worth I did my first GM 12 bolt truck this summer and changed all the bearings, seals, ring 3.73, pinion, and added a Truetrac. So far it has been silent, running cool, and everything works so far. I think it looks just slightly too deep as well. Your backlash measurement is very good but when you change any of the shims on the carrier or pinion it all goes back out the window to try again. I had to fit and refit mine many times to get it the best I could in all directions with the shim set I had. I don't remember using so much on the pinion. I recall mine was around .026-.028 but each one is an individual and yours will vary. I admire your efforts, best of luck to you and you are getting close. Maybe a little deep but not too bad in my opinion. Ok cool, too deep as the markings are darker towards the bottom correct? Shim in it is at .042, the next size down I could make was .040 which moved the marking alot closer to the top if that makes sense. Will I have a catastrophic failure running it as is? My no answer answer. Hard to tell by pictures alone but you are very close. If it is too close it will run hot and bind. 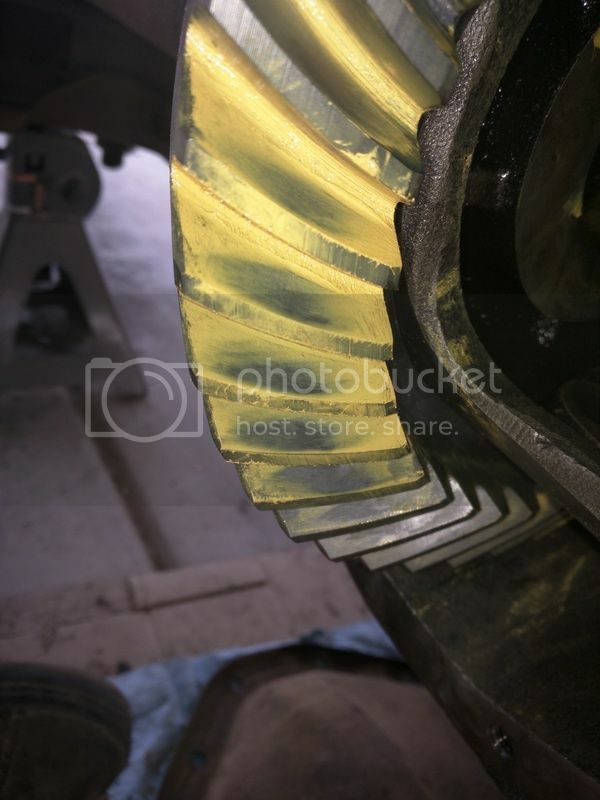 Is this a gear ratio change or not? 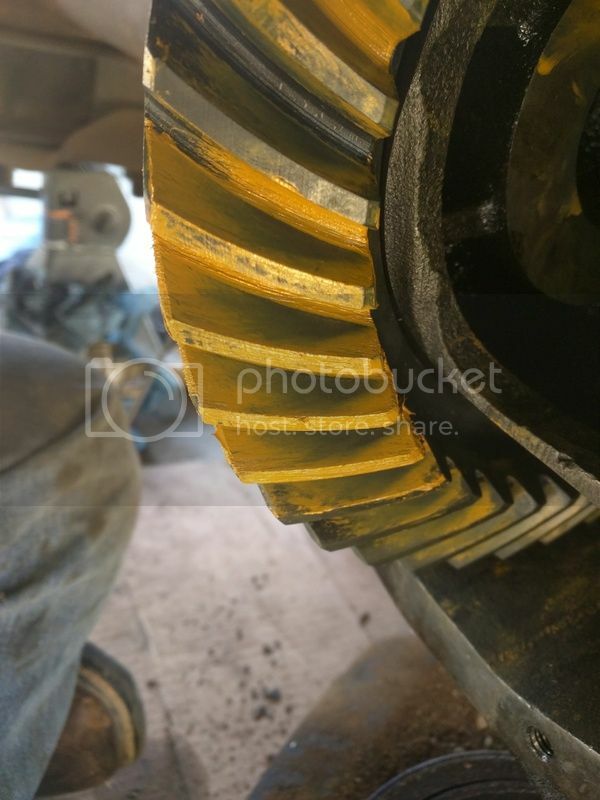 If it is the same ratio then the original shim thickness on the carrier and pinion is a good place to start as a baseline but rarely do they every end up being exactly the same when finished. Use as many shims as you can on the carrier sides using a gentle tap of a hammer to get them in. When using your marking paint make sure to give the carrier some resistance when turning. Also with it all assembled when you spin the pinion/driveshaft yoke by hand the resistance should be even and smooth to the feel through the full rotation of the ring gear. 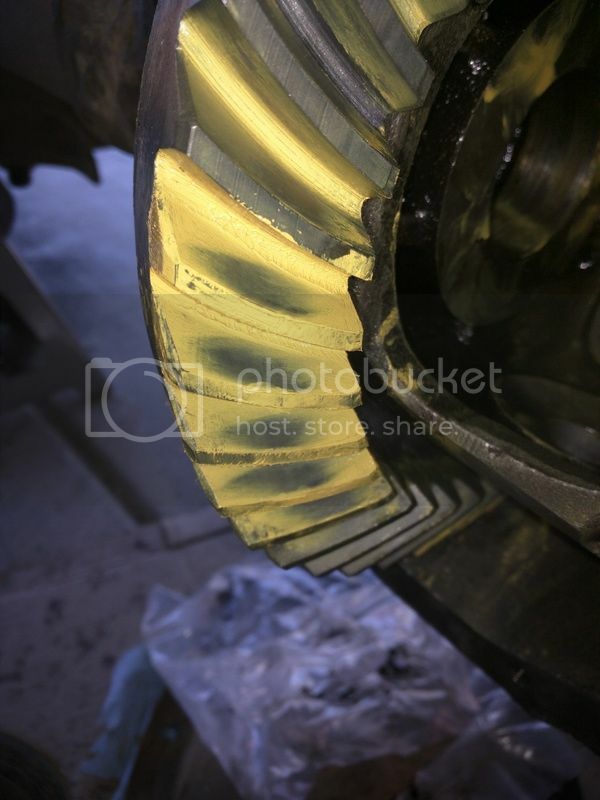 If there are any tight spots or something does not sound right I would then go with a thinner pinion shim but then your backlash will probably grow but if it stays under .010 you are good. So would y'all say I'm good to go? Gonna install the bearings and button it up today. 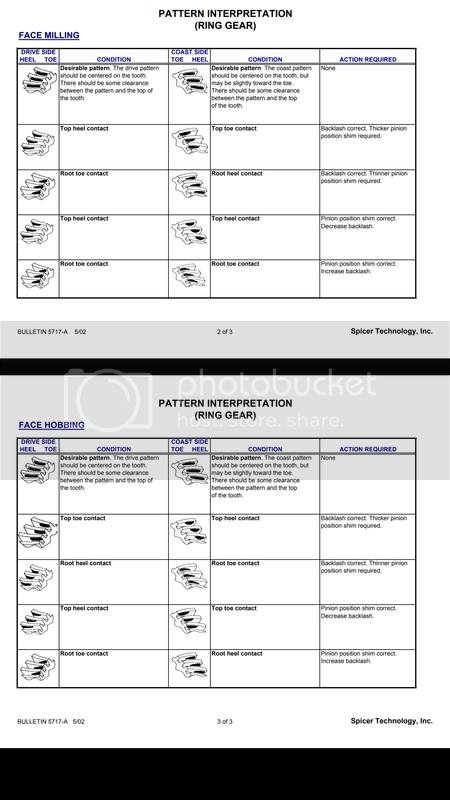 So I was looking at this PDF, under face hobbing I can see the the pattern for coast, decrease shim, looks similar to mine, although my pattern is more centered. My drive side I think looks ok correct? Am I like .001-.002 off? I also see for the correct pattern, it says my coast pattern can be closer to the toe, what y'all think? Don't mean to insult but the crush sleeve is very important and changing the shim(s) a lot can damage the tension qualities of the sleeve. Be careful with that. Excellent thanks, it's getting a new sleeve and nut for final assembly. This truck needs to be super safe and reliable since it'll be carrying my wife and son on long trips. Ok, got two shim packs built, current was a .039, I have a .037, and .035. hopefully .037 does it, hopefully backlash will still be good. I'll find out Friday. Ok, new pattern fellers, started with .037, then .035, no good, my shims would only allow for the next size down, .034 or .032. I was thinking using .034, put went with .032 instead. Here it is with .032, please give me some good news! That pattern will run just fine....just make sure the backlash is in tolerance..
Post 9 is your best pattern, although your first pattern was good too for a performance application and most gear sets are lapped for a toe pattern. There is a corvette guy that does a lot of rear ends, I will find. A pic of his patterns and Post back. The current pattern will put way too much load on the heal of the teeth and if you have horsepower will break a tooth. The pattern on the drive side should be slightly towards the toe since under load the pattern will shift to the center. Don’t worry about the coast pattern as far as placement unless way off. 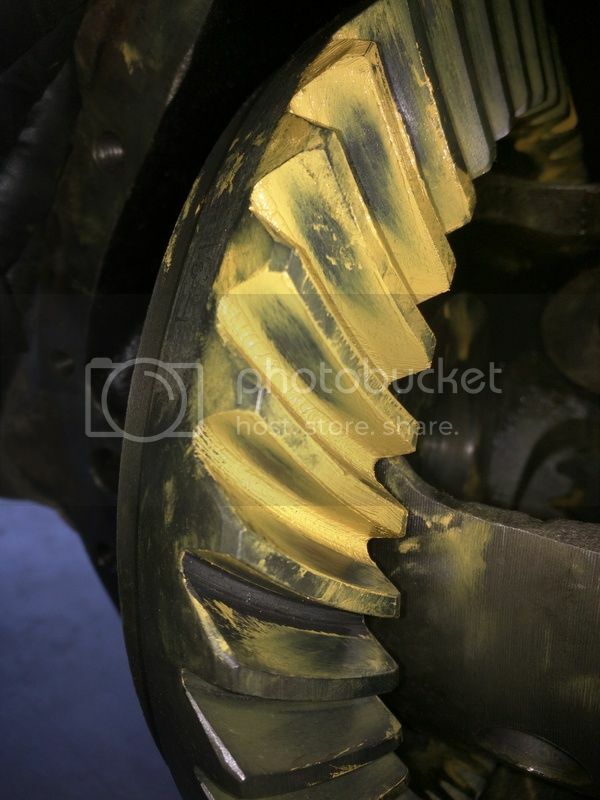 If you can you should be putting a load on the ring gear and turning the pinion with a socket. You can rig up a couple bolts and a hard wood block to load the ring gear. Ok thanks, horsepower is only 250, but it does have 35" tires. I was putting load on the pinion with a breaker bar and a wrench on the carrier... I really couldn't get the drive pattern to shift towards the toe much at all. Either way, gotta get this right, the local shop wants $2k to set this up. I'm thinking if I can pull the backlash in to around .008 some how I'd get a better pattern. The coast and drive pattern are in the same spot, seems to be centered top and bottom, backlash should pull it center a bit. 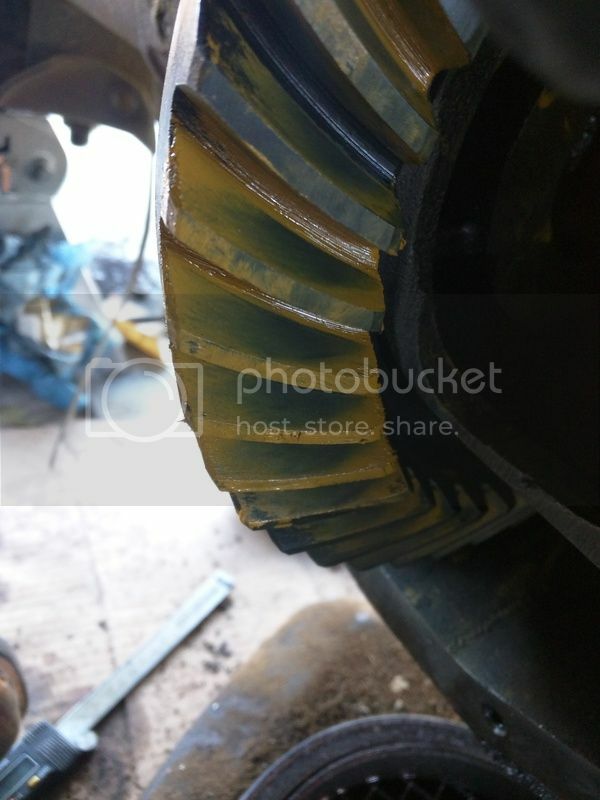 BTW this is a hobbed gear. Look at your first pattern it was towards the toe. Here is a pic of the corvette guys pattern, he has a motor to turn the diff with a load so he gets a real clean pattern. 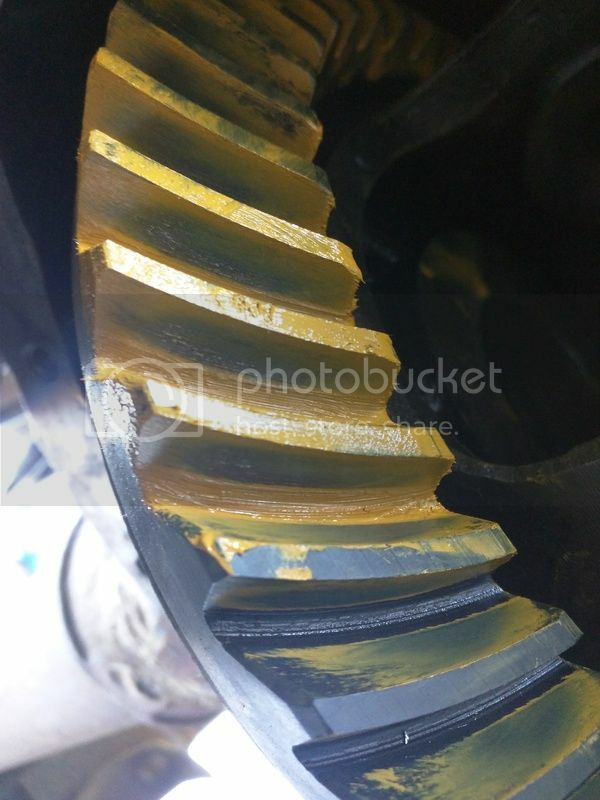 I usually turn my pinion with a slow speed 1/2” drill while loading the ring gear with a block of wood....cordless dewalt or other good drills on low speed will work too. Ok, ya, looks like I'm way off compared to that pic. I think I'm just gonna have to give in and take it to a shop, I can't have this thing let go when I'm in the middle of the desert when it's 120* outside haha, I can say I tried.